A 1912 envelope from the Aurora to New Zealand postmarked Hobart, 17 March 1913. From the John Clemente collection. Between the years 1876 and 1910, Aurora made the annual trip from Dundee, Scotland to St. John's, Newfoundland to take part in the whale and seal hunt in the North Atlantic. There were a couple of notable events in this time. In 1884, along with other whalers in the area Aurora made an attempt to rescue the Greely Expedition and her captain, James Fairweather assisted with a repair to the US relief ship Bear, and in 1891, the ship came to the rescue of the crew of Polynia when she was crushed in sea ice. In 1910, she was bought by Douglas Mawson's deputy, Captain J.K. (Gloomy) Davis, for ₤6,000 for his Australasian Antarctic Expedition. Aurora made the journey from Hobart, departing on 2 December 1911, Australia to Macquarie Island,where a radio relay station was established. She left the island on 25 December, arriving at Cape Denison, 8 January 1912, where the main base was built (Mawson's Huts). She departed on 19 January, heading West to establish the Western Base. The site was decided in what is now known as Queen Mary Land, on 1 February 1912. After building the main hut 'The Grottoes' on the stable ice shelf, Aurora left for Hobart on 20 February, arriving in Hobart on 12 March. In December 1912, Aurora returned to find that Douglas Mawson, Xavier Mertz, and Belgrave Edward Sutton Ninnis had set out on a sled expedition, and were overdue on their return. The captain attempted to wait for the expedition to return, but poor anchorage and extremely strong winds combined to cause a number of anchor chains to break. At the end of January the ship had to leave to pick up the Western Base Party. After yet another long blizzard delaying them further, they left on 8 February, reaching the Western Base party on 23 February, loaded quickly and headed North, arriving in Hobart on 15 March. Over the ensuing months, Davis raised extensive rescue funds, and had Aurora refitted. Departed Hobart 15 November 1913, collected the radio relay party under George Ainsworth at Macquarie Island, anchoring in Commonwealth Bay at 07h00 3 December 1913. She left Commonwealth Bay 25 December, and after an extensive coastal exploration, finally arrived in Port Adelaide 26 February 1914. In 1914, Sir Ernest Shackleton tasked Aurora to help set up supply depots along the route for his Imperial Trans-Antarctic Expedition. After being delayed by sea ice in McMurdo Sound in January 1915, Aurora managed to make her way further south, and sent teams off to set up the depots. Eventually she made her way to Discovery Bay on 12 March 1915, where she anchored and continued to offload supplies. In May, Aurora was trapped in the ice, and was carried out to the sea, stranding the men that were setting up the depots. She remained trapped in the ice for the better part of a year, drifting some 1600 nautical miles. It was not until 12 February 1916 that the ship escaped from the ice, making it back to Dunedin, New Zealand on 3 April. The Australian, New Zealand and British governments agreed to fund the refit of Aurora for the rescue of the Ross Sea Party. An Advisory Committee was established in Melbourne, consisting of Rear Admiral Sir William Cresswell, Professor Sir Orme Masson, Captain J.R. Barter, Commander John Stevenson and Dr Griffith Taylor. Shackleton's expedition funds were fully expended. After his legendary ordeal on Endurance in the Weddell Sea sector, Shackleton arrived in New Zealand during December 1916. The three governments involved were adamant that he would not lead the rescue expedition and at their insistence John King Davis was appointed to captain Aurora. After negotiation Shackleton sailed aboard Aurora, but Captain Davis had total authority on the voyage. On 10 January 1917, the ship pulled alongside the pack ice near Cape Royds and worked her way to Cape Evans. One week later, the seven survivors of the original ten members of the Ross Sea Party were headed back to Wellington, New Zealand aboard Aurora. Aurora was last seen in 1917, when she departed Newcastle, New South Wales, bound for Iquique, Chile with a cargo of coal. Lloyd's of London posted the ship as missing on 2 January 1918; it was believed she was a casualty of World War I, possibly being sunk by a mine laid by the German merchant raider Wolf. One of Aurora's lifebelts was recovered from the Tasman Sea between Sydney and Brisbane six months after her disappearance. In 1927, a Mr. G. Bressington was walking along the beach near Tuggerah, New South Wales and noticed an old wine bottle partly buried in the sand. Upon examining the bottle he saw an engraving of the picture of a ship and on the other side the following message: "Midwinter's Day, 1912, Shackleton Glacier, Antarctica. 'Frank Wild, A. L. Kennedy, S. Evan Jones, C. Arch. Hoadley, Charles T. Harrisson, George Dovers, A. L. Watson and Morton H. Moyes". The story of the bottle is that it was one of three given to Sir Douglas Mawson when his expedition left England in 1911. The bottles were given by Mr J. T. Buchanan who had them left over from the Challenger expedition and wished the party to drink them on Explorer Day. Mawson passed one bottle on to Frank Wild, who led the Western Base Party whilst Aurora was under the command of John King Davis. When the wine was drunk on the day, the party's artist Harrisson engraved a picture of Aurora on one side and the names of the party on the other. It is thought the bottle was still aboard Aurora when it left Newcastle in 1917. ^ The John Clemente collection of Tasmania postal history. Spink, London, 2016, p. 87. ^ "Alexander Stephen & Sons, Dundee Yard-list". Maritime History Virtual Archives. Retrieved 2 July 2012. ^ Lindsay, David Moore (1911). A Voyage to the Arctic in the Whaler Aurora (First ed.). Boston, USA: Dana Estes & Company. 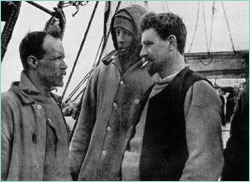 ^ "Whaling Captains listed in 'Arctic Whalers,' by Basil Lubbock - The Whalers' Heritage Project - ExploreNorth". www.explorenorth.com. ^ "The Relief of Shackleton's Ross Sea Party". The Geographical Journal. 49 (3): 218. March 1917. doi:10.2307/1779498. ^ "Mystery of the sea. Loss of the Aurora. Victim of the Wolf". The Argus. 5 November 1921. p. 4. ^ "The Mercury (Hobart, Tasmania)". Strange Sea Story. 26 May 1927. Retrieved 30 October 2014. ^ Rycroft, Nancy (2005). Captain James Fairweather Whaler and Shipmaster. Ripponden, West Yorkshire, England: Fairweather Books. p. 53. ISBN 09551739 06. John King Davis, CBE was an English-born Australian explorer and navigator notable for his work captaining exploration ships in Antarctic waters as well as for establishing meteorological stations on Macquarie Island in the subantarctic and on Willis Island in the Coral Sea. Capt Morton Henry Moyes OBE FRGS BSc RAN was an Australian Antarctic explorer and naval officer.